Big things are happening with GenArts in the very immediate future. 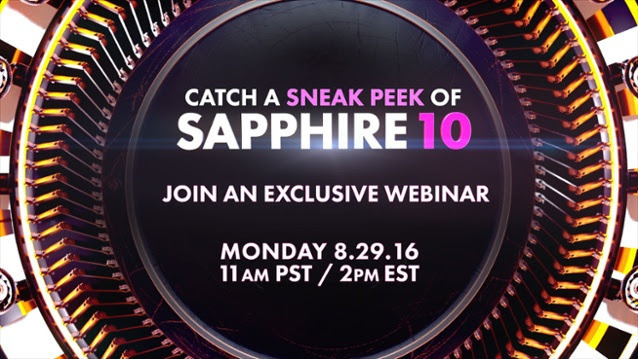 Come get a sneak peek at the brand new Sapphire version in a webinar presented by Brian Fox (Director of Product Marketing) and Alex Keown (Creative Specialist). The webinar is set to give a satisfying overview of everything that's new, including brand new effects and presets, improved workflow functionalitity and more. Spaces are limited so be sure to register as soon as possible. Sapphire Flash sale coming August 30th! In just a few days our 2 day flash sale will begin. This will be for version 9, but don't worry as purchases include a year of free upgrades and support, so you'll be able to get 10 as soon as it launches.